Since we are well ensconced in the New Year now seems as good a time share my 2016 reading goals. On the whole, I was pleased overall with my reading in 2015. Not only did I meet my GoodReads goal of finishing seventy-five books, I also managed to exceed my goal of reading five audiobooks. Though I had reading dry spells throughout 2015, I can’t fault myself: I managed to meet and exceed my own high expectations! Read at least 10 audiobooks. Last year I set out to read five audiobooks and managed to read six. Last month I added the Overdrive app to my iPhone and I have been devouring free audiobooks from my local library on the regular. In the first few weeks of the year I have already managed to read two books; I think that I will be able to complete eight more by the end of the year with no problem! Read at least 10 ebooks. Over the holidays I was given a Kindle, one of the most thoughtful gifts that I have ever received. This year I would like to read at least 10 ebooks and begin to feel more at home with the format. Complete at least one manga series. Late last year I started reading Death Note and I am besotted. There are thirteen books in the series and I am on the fourth. Provided the series doesn’t implode on itself, I am hopeful that I will be able to sustain my interest in the series and see it through to its conclusion . . . and hopefully hold off on getting ahead on my reading in the series’ anime! Complete at least one YA series. Since I am teaching Middle School now it’s important that I am “up” on what the wee folks are reading. I’m not afraid to admit that my knowledge of tween and teen lit had grown thin since my own youth and that I have been making up for lost ground for the past several months. I would like to read at least one young adult series from start to finish to help me becomes more entrenched in the literary world of my kids. Read more with my pug. I know that this may sound funny to the uninitiated, but my pug loves to be read to. When I first adopted her, I read to her all the time. I would like to get back in the habit of reading to her again as a way to re-cement our bond and to wind down from a stressful workday with her. Read a series of novels. Basically, this goal is my low-key way of saying that I want to read Marcel Proust’s In Search of Lost Time while still giving myself an “out” if I manage to get to November without completing Swann’s Lane. Read more diversely. Though I haven’t run the numbers, I believe I read an equitable amount of works by men and women. While this isn’t a conscious decision, I think my diverse interests have brought me into intellectual contact with a near-equitable number of ladies and gentlemen. However, save for the occasional Japanese novel I read works primarily by North American or European writers; primarily white cis-gendered ones. I would like to consciously try to incorporate works by non-white, non-American/European authors, particularly by LGBTQA authors into my TBR with the ultimate goal of having 25% of the books I read this year ticking this box. 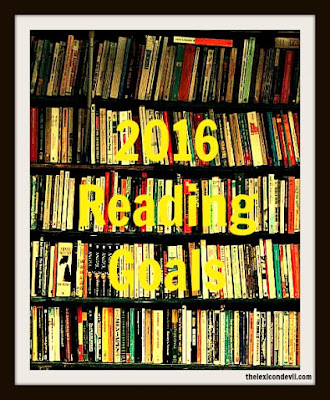 What are your 2016 reading goals? Let me know on Twitter @thelexicondev.